Our shallow sound waters are ideal for sports. Experience sights and sounds you’d miss on shore. Adventurers can ride the surf of the Atlantic Ocean or paddle past the breakers and glide alongside a pod of dolphins. 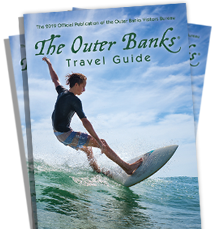 For the novice, you can glide through the salt marshes, explore the tiny uninhabited islands, or take a historical trip around Roanoke Island. Outfitters offer rentals, instruction and guided ecotours.